Covina junior Aaron Rodriguez got off to a quick and a high start in the pole vault this year, with his 14-00 jump in the early season Covina Five Way meet in February. The jump was not a complete surprise – he was the Frosh/Soph winner at the SGV Champs last year with a then PR jump of 13-02, and advanced to CIF after a third place finish in the Valle Vista League. This past week on his home runway in the Northview dual meet – he took it even higher with a 14-09 jump for the win. That jump ranks him equal 43rd All-Time San Gabriel Valley, and it makes him our male Athlete of the Week. The week saw six more athletes earn All-San Gabriel Valley honors, and nine athletes who had already reached the All-SGV standard improved their marks. Osvaldo Cervantes picked a pretty big stage to open his 2018 season – the Sweepstakes race at the massive Woodbridge Invitational. But he kept his head (and his feet!) to finish 40th in a lifetime best 14:45 – #3 in the SGV so far, and that makes him our Athlete of the Week for Week 3. Arroyo senior Noah Hibbard is our first SGV Athlete of the Week for 2018, on the strength of his dominating win at the Rosemead Invitational. His 14:28 at Rosemead was the fastest ever for a SGV athlete on that course. Noah is the defending Mission Valley League champ, and finished 14th at last year’s CIF-SS Div. 2 Finals. His win on Saturday was nearly a minute faster than his time there last year, so both he and his team have set their sights much higher for 2018. 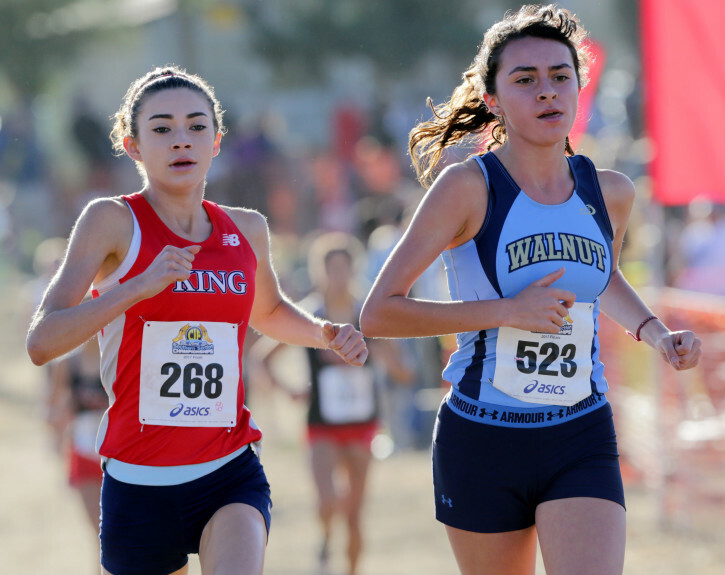 Walnut senior Chloe Arriaga has been named the San Gabriel Valley News Group’s girl Athlete of the Week, on the strength of her dominating win at last Saturday’s Fastback Invitational. Chloe and the Mustangs race next on Saturday at the Rosemead Invitational. 2018 was a solid year for our boys as the top athletes and the top teams were tightly bunched in the final 2018 All-San Gabriel Valley Track & Field lists. Four boys each earned All-SGV honors in three events: Chuma Azinga (San Marino, Sr) – 110 hurdles, High Jump & Triple Jump; and Ryan Cowgill (Claremont, Jr), Xian Shively (Poly, Sr), and Noah Hibbard (Arroyo, Jr) each in the 800m, 1600m & 3200m. 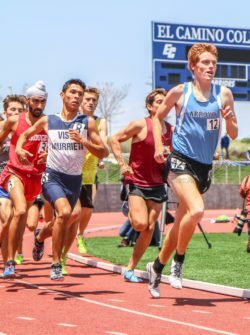 But Noah was the only athlete to also place in the California Top 100 in each his three All-SGV events, so he earns top honors for 2018. Monrovia bunched performances in the sprints, hurdles & relays to led all schools with 9 All-SGV performers and relays, followed closely by California, Claremont and La Serna with seven each. The All-San Gabriel Valley Standard is 98% of the 100th best mark achieved in California in each event the previous year. An average of 8.3 boys met the standard in each event, while 2.8 per event ranked among California’s 100 best. The SGV’s best event was the 800m, where a whopping 19 boys earned All-SGV status, with five ranking in the State 100. Arcadia senior Stephanie Yen who will be attending UCLA this Fall, was 2018’s top All-San Gabriel Valley performer, meeting the All-SGV standard in five events: 200m, 100 hurdles, 300 hurdles, Long Jump and Triple Jump. Stephanie’s marks in the long hurdles and long jump also ranked in the California Top 100 for 2018, and the mark in the latter event, 18-04.50, leaves her ranked #28 on the SGV All-Time Performers List. Bonita led all schools with 13 All-SGV performers and relays, followed closely by Arcadia and Claremont with twelve each. The All-San Gabriel Valley Standard is 98% of the 100th best mark achieved in California in each event the previous year. An average of 6.6 girls met the standard in each event, while 3.8 per event ranked among California’s 100 best. Our girls’ best event was the 3200m, where 14 girls met the standard, with 7 ranking in the State 100. 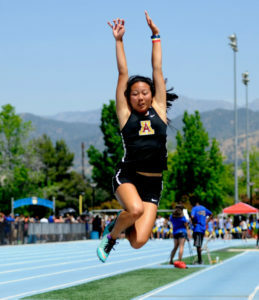 The girls of the SGV had an outstanding League Finals week with twelve All-Time Performances. Even more astoundingly, four of those twelve came in the 300 hurdles, and three came in the same race, with two from the same team! Friday’s Rio Hondo League Final was the site of that historic race, where three of the seven finalists achieved All-Time results. 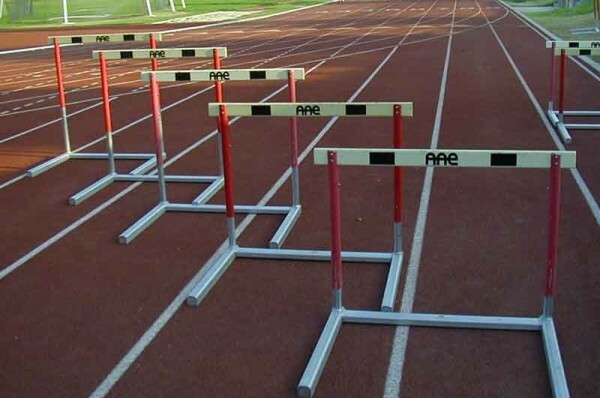 Tops was 100 hurdles leader Syndey Mosley (Sr, Monrovia) – her 44.99 was a 1.4 PR and makes her #29 A-T SGV. She was followed by two South Pasadena athletes – Alexis Mora (Jr) – 45.18 (1.50 PR) and Kate Kutzer (So) – 45.49 (a nearly 2 second PR), and they now rank #36 & #42 respectively on the All-Time lists. And this great race makes these three girls our collective Athletes of the Week. Week 11 saw 38 athletes and relays meet the 2015 All-San Gabriel Valley Standards for the first time, and 20 others improve on their marks. Still getting caught up after the rush of SGV meet week, we want to make sure to take note of the top performances leading up to the week. The Mt.SAC Relays saw a rash of fast sprint performances, but almost all of them were considerably wind-aided. Damien’s Zach Shinnick and Thaddeus Smith and Diamond Ranch junior Daniel Stokes – the SGV’s top 2015 dashers all ran very well. Stokes won the Seeded heats of the 100 & 200, defeating Smith in the 100, while Shinnick was 5th in the Invite 100 and Thaddeus was 2nd in the Invite 200. The night before, SGV 800 & 1600 leader Dillon Beckum (So, Bonita) showed his range by finishing 4th in the Invite 3200 in 9:16.98 – a probable school record. The only All-Time performance that came outside the SGV Champs covered above was Zach Shinnick’s 47.85 in the Los Osos dual meet. This was a new best for Zach, but he remains #17 All-Time SGV. Here is the updated 2015 All-San Gabriel Valley List list for the boys. 120 athletes and relays have exceeded in the the standard for the 16 events, an average of 7.5 per event. We still don’t have a thrower who has made the standard, but after the amazing 1600 at the SGV, 16 boys have earned All-SGV honors in that event.